Bead-making is fun but it can be challenging especially when you don’t know the basics. So I dug into my library and today I will be showing you a video that explains everything you need to know about beads. Watch carefully and take down notes if possible. Did you miss yesterday’s lesson? We learnt how to make a leaf necklace using only strings. Click here to view it. Tomorrow, I will be sending you more tutorials and a little book (about 2 pages) on how to make an ombre bracelet. 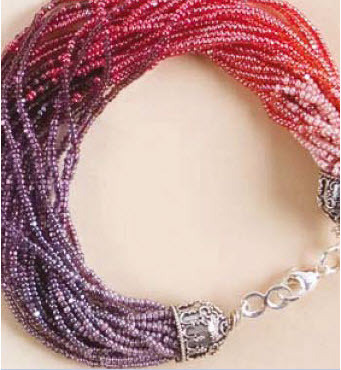 This Ombre bracelet is divine and the best part is that if you double the beads, you can make a necklace (if that ‘s what you prefer). The best part is that you can change the colours. Maybe you prefer your ombre to be white to red, or pink to green (the ombre is better when its complimentary colours). So stay tuned. Tomorrow I will be including this tutorial for you.